Olga and Tatiana's room was painted pink and the floor was covered in thick carpet. Above the cornice was stencilled a lively Art Nouveau-style frieze with dragonflies soaring through the air. Here is a view of the room taken during the the 1920's when the palace was a museum. "The Empress dressed her daughters well. Sometimes all four were dressed alike, sometimes the two elder wore one colour, the two younger another. 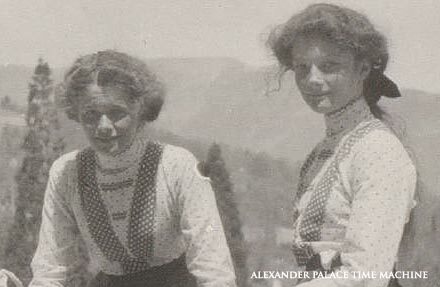 Though their outward surroundings had, naturally, to be luxurious, their private lives and tastes were very simple, simpler indeed in many ways than the lives led by many Russian girls of less position. The Empress would not allow them to be pampered. They dressed themselves, their maids only arranging their clothes. According to the tradition of Russian Court nurseries, dating from the time of Catherine II, when Rousseau's ideas on education bad been followed, they slept on hard camp beds. They went on wearing their clothes until they were worn out, or they had outgrown them, when the dresses of the elder girls were altered for the younger ones. The Empress did not like squandering money, though she was so lavish in charity. The Grand Duchesses had large fortunes of their own, but they were each given, as pocket money, only two pounds a month, with which to buy their note-paper, scent, small presents, etc. Their dress bills were of course paid for them. In this way they learned to think before spending. Every present they gave was' the result of some personal sacrifice. They had to go without something for themselves before they could buy anything for their parents, sisters and ladies-in-waiting, "out of their own pocket." In this way their mother hoped to make them realise the value of money, a thing that princes find it hard to understand. But etiquette prevented their going into any shops but those of the little stationers at Tsarskoe Selo and Yalta, and they never bad any clear idea of the value and price of things." "The girls were all very good-looking. The eldest, the Grand Duchess Olga Nicolaevna, was fair and tall, with smiling blue eyes, a somewhat short nose, which she called CC my humble snub," and lovely teeth. She had a remarkably graceful figure and was a beautiful rider and dancer. She was the cleverest of the sisters, and was very musical, having, her teachers said, an " absolutely correct ear." She could play by ear anything she had heard, and could transpose' complicated pieces of music, play the most difficult accompaniments at sight, and her touch on the piano was delightful. She sang prettily in a mezzosoprano. She was lazy at practising, but when the spirit moved her she would play by the hour. Olga Nicolaevna was very straightforward, sometimes too outspoken, but always sincere. She had great charm, and could be the merriest of the merry. When she was a schoolgirl, her unfortunate teachers had every possible practical joke played on them by her. When she grew up, she was always ready for any amusement. She was generous, and an appeal to her met with immediate response. "Oh, one must help poor so-and-so. I must do it somehow," she would say. Her more careful sister, Tatiana, would suggest practical measures, would note names and details, and come back to the subject later out of a sense of duty. Olga Nicolaevna was devoted to her father. The horror of the Revolution told on her more keenly than on any of the others. She changed completely, and all her bright spirits disappeared. Tatiana Nicolaevna was to my mind prettier than her sisters. She was taller even than the Empress, but she was so slight and well-proportioned that her great height was not remarkable. She had fine, regular features, recalling pictures of ancestresses who had been famous beauties. She had dark hair, a rather pale complexion, and wide-apart, light-brown eyes, that gave her a poetic far-away look, not quite in keeping with her character. This was a mixture of exactness, thoroughness and perseverance, with leanings towards poetic and abstract ideas. She was closest in sympathy to her mother, and was the definite favorite of both her parents. She was completely unselfish, always ready to give up her own plans to go for a walk with her father, to read to her mother, to do anything that was wanted. It was Tatiana Nicolaevna who took care of the little ones, and who -was a constant help to the Household, always willing to help them in arranging that their official duties should not clash with their private engagements. She had the Empress's practical mind and love of detail. She planned and arranged everything in the "Children's quarters " as it was called. She had a less strong character than Olga Nicolaevna, whose lead she would always follow, but she could make up her mind in an emergency quicker than her elder sister, and never lost her head. When her brother was ill, Tatiana Nicolaevna could take her mother's place, following the doctor's directions and playing with the sick boy for hours. Out of a sense of duty, she undertook more thin her share of public appearances. She was shy, Eke all her sisters, but her natural friendliness made her want to say pleasant things to people. She became much better known than her cleverer elder sister, as she took more trouble about the people she met. Tatiana Nicolaevna loved dress. Any frock, no matter how old, looked well on her. She knew how to put on her clothes, was admired and liked admiration. She was sociable, and friends would have been welcome, but no young girls were ever asked to the Palace. The Empress thought that the four sisters should be able to entertain one another. They were close friends when they outgrew the squabbles of childhood. The two elder shared one bedroom, the two younger another, while their schoolrooms and dining-room were in common. 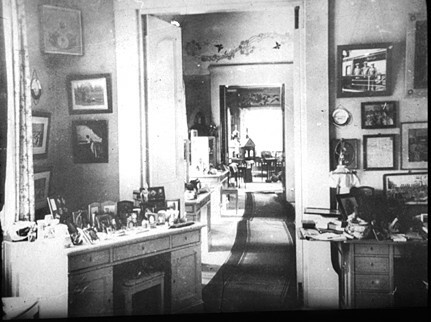 The little Tsarevich had his own rooms, in which M. Gilliard ruled. Left: A picture of Olga in Russian costume. On the walls were popular prints, including copies of Kaulbach's portrait of Alexandra and Serov's famous painting of Nickolas II. The Grand Duchesses also hung lots of souvenirs from cruises on the Imperial Yacht, Standart on the walls of their rooms. These included photographs of the officers they had become friends with onboard the yacht. Here on the walls could also be found many watercolors including three by the Russian artist, Volkov, who was popular with the family. There was also one by their mother, Alexandra, of roses. In the left corner of the picture above is a copy of Our Lady of Tsarskoe Selo ikon, who was the patroness of the Grand Duchesses.